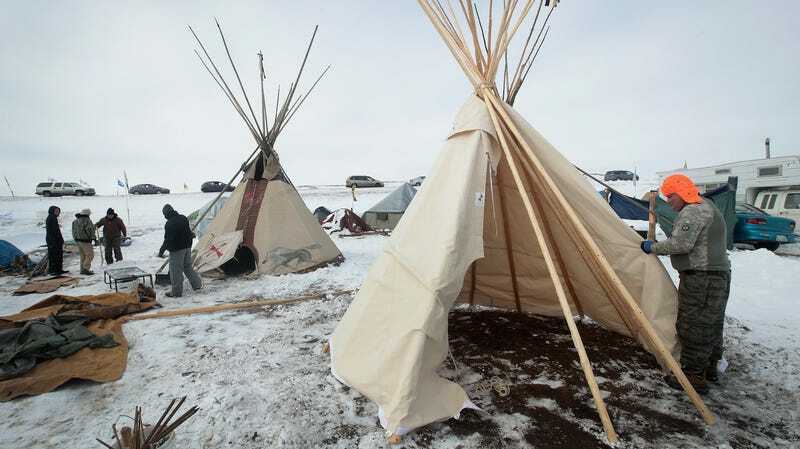 Hawk Laughing, a Mohawk originally from northern New York, helps to build a tipi at Oceti Sakowin Camp on the edge of the Standing Rock Sioux Reservation on December 2, 2016 outside Cannon Ball, North Dakota. The Supreme Court has dealt a major blow to Native American voters. On Tuesday, the court upheld a lower court’s ruling that will allow North Dakota to enforce voter ID laws, ruling against the Native American groups who argued that the requirement will suppress votes of tribal residents whose government-issued identification cards don’t fit the ID law’s criteria. Ruth Bader Ginsburg wrote the dissenting opinion, with Elena Kagan joining her (recent appointment Brett Kavanaugh did not participate in the ruling). As Mother Jones notes, the ruling will likely make it harder for the state’s sole elected Democrat, Sen. Heidi Heitkamp, to retain her seat—in 2012, she won by a margin of less than 3,000 votes with a strong showing from Native Americans. Her Republican opponent, Kevin Cramer, is a dude who thinks that #MeToo is a “movement toward victimization.” North Dakota’s seat is one of the few key seats Democrats need in order to flip Republican control of the Senate. Republicans argue that such laws combat voter fraud—something that rarely happens—but in reality, the laws further disenfranchise communities of color who may not have access to, or be able to obtain, specific forms of identification. A federal appeals court reversed Hovland’s order and the Supreme Court upheld the law.